A Hopback can be used at two points in the brewing process. Firstly to add another layer of Hop Aroma’s to the just boiled wort, and secondly as a Randall in between the keg and the tap to add a further fresh hop twang. Additionally the Hopback acts as another filter layer so will hopefully help with getting a clearer final beer too. Initially I was tempted with a shiny stainless steel Blichmann version however before I reached for my wallet I fortunately stumbled across the website above that provided my inspiration to build my own! 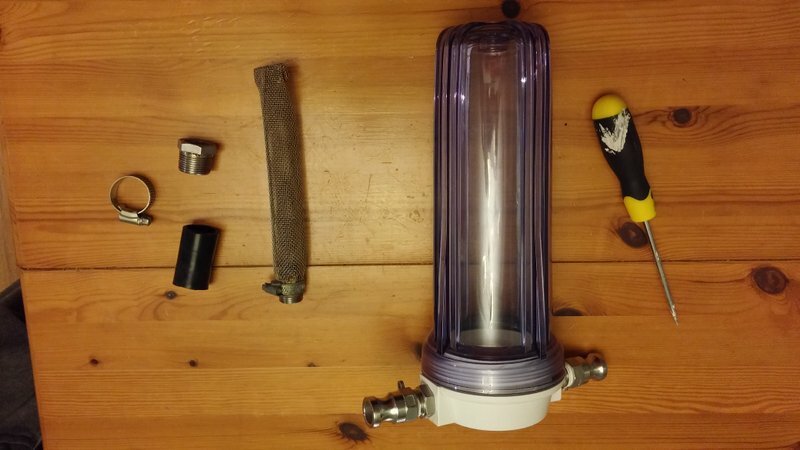 The build starts with a 10″ water filter housing purchased on Ebay. I went for the clear plastic option. See-through is the new shiny! 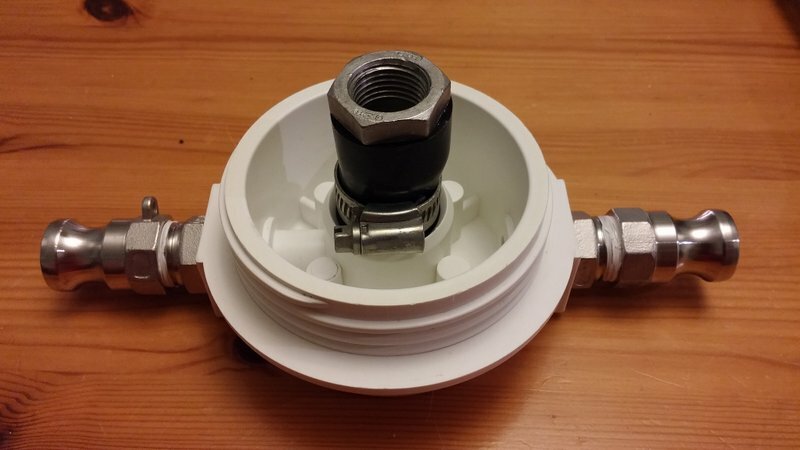 I removed the filter housing (the top part of the assembly) and fitted it with a small section of flexible hose held in place by stainless steel hoseclamps. 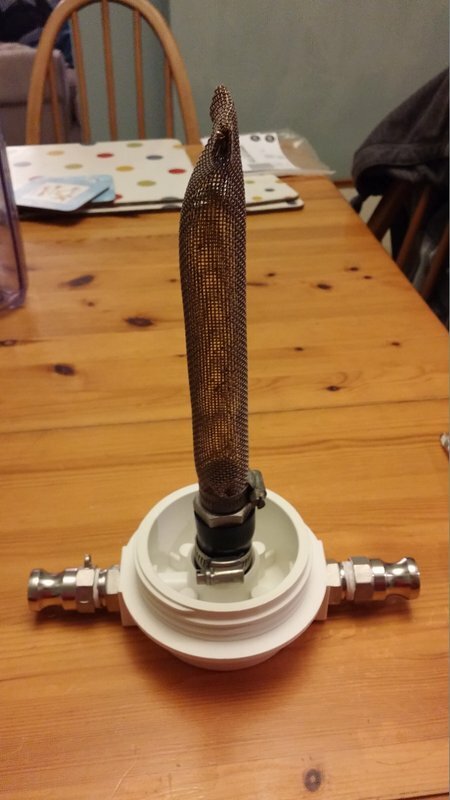 The 12″ Bazooka screen I removed from my boiler was cut down to around 8″ and screws nicely into the cap fitting. And that’s all there is to it! Hop leaves are put in the filter housing and then after flameout, while the wort is still hot, I use a 24v Solar Pump to circulate the wort through the hopback before returning it to the boil kettle. 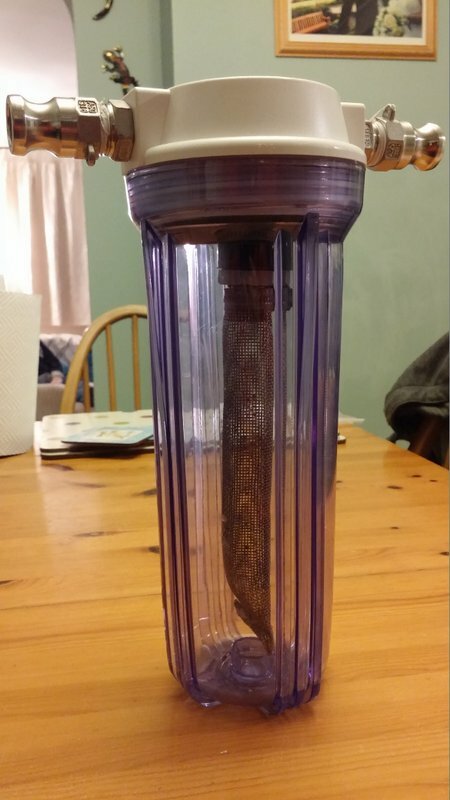 Further modifications will probably include a length of stainless steel tubing to force the beer to the bottom of the casing however I have used this a number of times now and don’t believe that’s a totally necessary alteration. In fact the only issue I have had was when I forgot to reinstall the washer and ended up spraying hot wort all over the brewery! Let that be a lesson to you all! Nicely done. I have just installed a replacement for Mk1 HopThang and it is currently circulating bleach/water before an infusion into 5PM saviour. I look forward to hearing how you get on! Thinking of building this and wanted to check how the pump performs with it? I’ve not had any issues (so far) with the 24v Solar Pump in my setup other than it is not powerful enough to create a useful whirlpool in the boiler on return from the hopback. If you’re not after a whirlpool it’s fine!